Friday, Oct. 5th (3 dives: 0:54, 0:59, 1:09) Since we were diving for two weeks, Alison was trying to pick different reefs for us each day. We went to Palancar Caves with Josh, Lucy, Amy, Bryan and Rich. We had a lot of issues to work out at first. The last issue was a group of divers that just barged right in on us and got all mixed up with our group. Alison got pissed off and asked us to wait for the obnoxious group to move on. Well as soon as we stopped, Alison looked downward found a little pipehorse right beneath her and right under her nose. She swears that it is the same one that lived about 100 meters north in another beautiful archway. She used to go and visit it all of the time but it disappeared one day. She could just swear that this is the same one! Then Josh pointed out a turtle on the wall and I found another big turtle just sitting there on the bottom. We ended up seeing four different turtles on that dive. The last one was a baby. Our second dive was at the French Reef. It produced another three turtles. There was quite a bit of current but everyone managed it well. There was a big green and orange rainbow parrotfish and it was letting loose a huge poop. Parrotfish contribute to the underwater environment by making sand for the bottom. 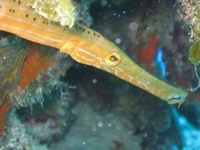 I found a trumpet fish and have a nice picture of it. On our third dive today, we practiced buoyancy for more than an hour hovering head down at 35ft and looking for sea horse in algea/sea grass... We saw a baby spotted moray. Nathalie was playing with her fish identification slate and the baby moray was attacking her slate.... We also saw several spider crabs. Saturday, Oct. 6th (2 dives: 0:49, 0:57) We dived Santa Rosa Wall with Josh, Lucy and Rich. The North wind made the surface choppy but it slowed the current way down and we had a beautiful dive. Josh showed us a big turtle paddling around in the deep blue water. On Tormentos we saw several big groupers, a few lobsters and a big, scary barracuda at a cleaning station. It had its mouth open and was getting its teeth cleaned. Those choppers sure are impressive! Sunday, Oct. 7th (2 dives: 0:42, 1:04) We went to the C53 shipwreck with Jaime, Debbie, Guiellermo, Amy and Bryan. Amazingly there was no current. We couldn’t have asked for better conditions. We circled the wreck, entered at the bow, visited the top deck, stern and bridge. We saw a huge snapper with pointed teeth that hung out on the deck. I also saw sea stars and lots of spider crabs. What a great drift dive we had on Las Palmas!!!!!!! 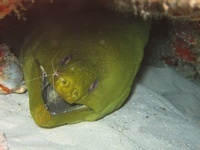 Upon reaching the bottom we found a 5-foot green moray eel sitting around under a small coral head. It didn’t take Alison long to find a nice splendid toadfish for Amy. Everyone got a good picture. Then we came up on an extra large turtle just sitting on the coral. It seemed to pose for the cameras. After we saw a couple of golden tail morays we found another good-sized turtle napping under a coral formation. Debbie said that the turtle looked like it was scratching its back on the coral but what it was probably trying to wiggle its way out from under the coral head and escape us.... Nathalie completed her fifth adventure (drift) dive and is now Advanced Open Water certified! Monday, Oct. 8th (2 dives: 0:35, 0:31) This is our last day of diving.... We went to Palancar Caves with Amy, Bryan, Josh, Lucy, Debbie and Jaime. When we got in everything was pretty normal. Gradually, the current got faster and faster. We ended up flying over the reef for the last 15 minutes of the dive. Nathalie foe scared and refused to go into one tunnel. We ended up separated from the group as I stayed with her (we`re buddy!). The current picked up to about 3 knots and we had to abort the dive as it was pulling us toward the deep end. We tried to go to Yucab, but every time Alison got in to check the current, it was just too strong. So Alison suggested to go to Chankanaab where the current is always weak, as a rule. When we got in and began our descent. The current was swift but it kept getting worse and worse until we were just flying in a snow storm again. The current was just crazy everywhere that day and it stirred up the sand reducing the visibility to 10 or 15 feet. It was just insane! We were staying as a group. We finally gave up and went to the surface after half an hour. Alison says she has not been in such difficult current for years (estimated to 5 knots). We actually finished the entire reef at Chankanaab in 6 minutes and the rest of the dive was spent flying over a sandy bottom. After such as short day, we went for lunch and Margarita with Alison. Tuesday, Oct. 9th It`s time to go back home.... Thank you Alison for this wonderful experience. JF, Great dive blogs. Just by reading it, I feel I am there diving again at those familiar beautiful dive spots in Cozumel. Thanks for posting. Ben.